Great stories can inspire great art and can also strengthen literacy. There is a great article by English teacher Judith Jester, who sites the powerful, proven connections between art and literacy. Art does not always get the credit it deserves, therefore I try to include links to articles and research whenever possible. I know now that developing the literate lives of my students is sometimes best achieved not by words alone (Jester 2003). This week we read, The Day the Crayons Quit. The book tells the story of a few overworked crayons who quit for various reasons. Some crayons work on holidays (red), others are disgruntled because their paper wrapper was removed and yellow and orange are no longer speaking because they cannot agree on the true color of the sun. Each crayon writes a letter expressing their feelings in words and pictures. Together, we all laughed (and laughed) then created these masterpieces. We began with a guided drawing. I demonstrated how crayons are drawn by using lines and shapes (elements of art), then each student was responsible for drawing images of things that were the color they selected. If you have not read this one, it’s worth reading! Who doesn’t LOVE art supplies? Even if you don’t dream of bouquets of freshly sharpened pencils, it is difficult not to fall in love with these GIANT pencils & colored pencils created by 3rd & 4th graders. This lesson was inspired by a Tennessee art teacher, Cassie Stephens. Students created armatures by using tag board and paper towel rolls. It is not easy to take a 2D material and make a 3D form, but these students really did an excellent job. After our armatures were complete, we got really (really) messy with paper mache glue! Once we the pencils had dried, we painted (first yellow, then pink, tan and black). Finally, tin foil was used to create the metal detail! Printmaking is one of my favorite areas of art! There are so many ways to introduce printmaking to children, but I love beginning with leaves (especially since it is fall). This week I took Kindergarten and 1st Grade on a leaf collecting adventure in the field behind the art room. We got a chance to examine different types of leaves and select ones that had the best texture and shape! After each student had selected their leaves we took them back to the art room and got to work transferring the ink from the leaf to a blank piece of paper. I demonstrated the process, then they each got a chance to try the process independently, then we did another one together! As a class, this project gave us the opportunity discussed composition and color. *Paint Recommendation: Crayola Washable Kids Paint because the colors are vibrant and they really do wash out of everything (hair, clothes… even the inside of noses). 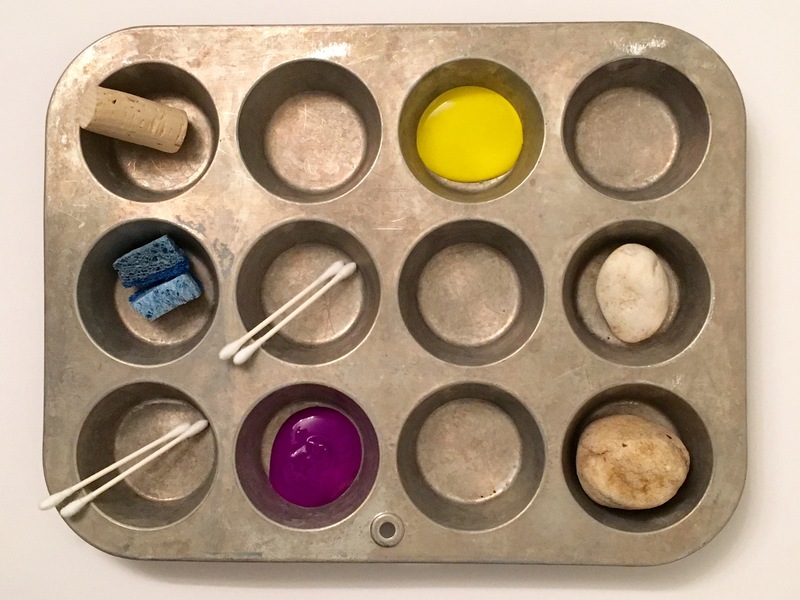 This Creation Station allows children to explore creating using variety of textures (hard, soft, rough, smooth, etc) while also learning to apply paint on different surfaces with different materials. Kitchen sponges, corks and q-tips allow children to begin experimenting with printmaking by stamping. The rocks are an especially important component because they provide a link to nature. It is important to get children to explore the world around them and look at everyday options in different ways. Painting rocks (if that is what your child chooses to do) suddenly opens the door to other art adventures. Some see rocks, others see spectacular small canvases waiting to be transformed! Last year I had Kindergartners & 1st graders explore color creation with paint, this year I decided to try something new. Using a recipe for Homemade Playdough I made A LOT of dough and colored it using liquid watercolors. Today, students got a chance to sculpt and experiment with the secondary colors (green, orange and purple) that they created. It was impossible not to get swept up in their color mixing excitement. Most students also learned how to create BROWN by mixing it all together at the end. 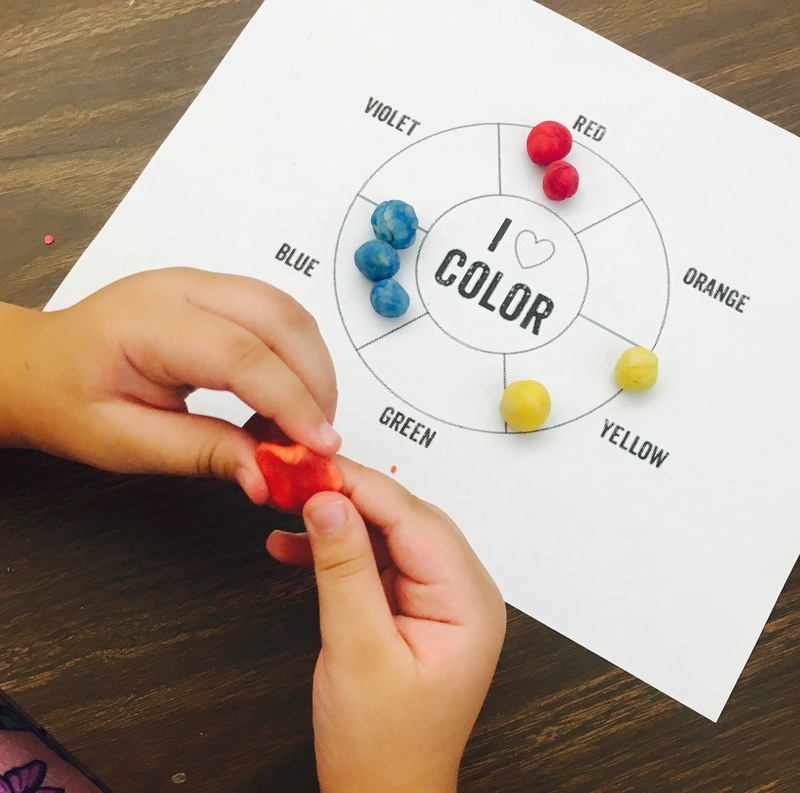 We discussed primary colors and their importance (you cannot mix two colors to create them). Students took turns locating primary colors around the room, on their clothing and they even pointed out a few primary color paint stains on the floor. Secondary colors were introduced, they are “second” because FIRST you need the primary colors to create them. We hypothesized which two primary colors would create secondary colors (green, orange, purple). 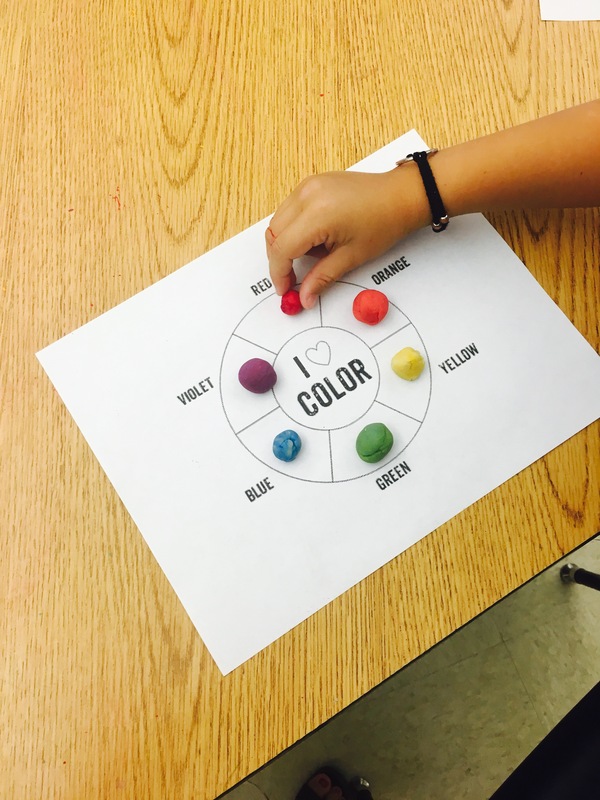 Together we looked at a color wheel then each student received a blank color wheel. 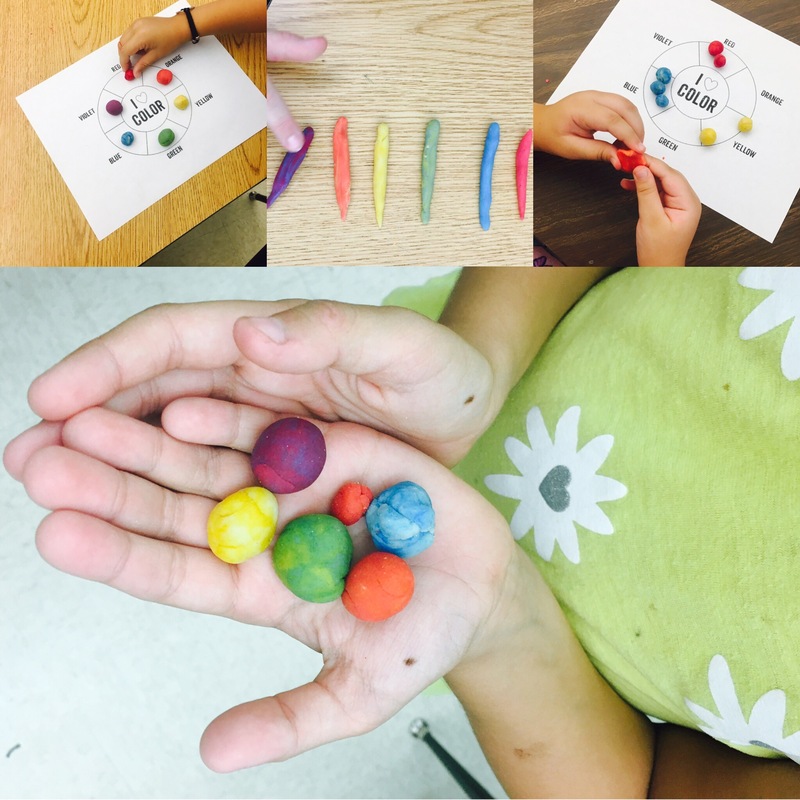 Each student made 3 red balls, 3 blue balls, and 3 yellow balls of clay and placed them on the color wheel. 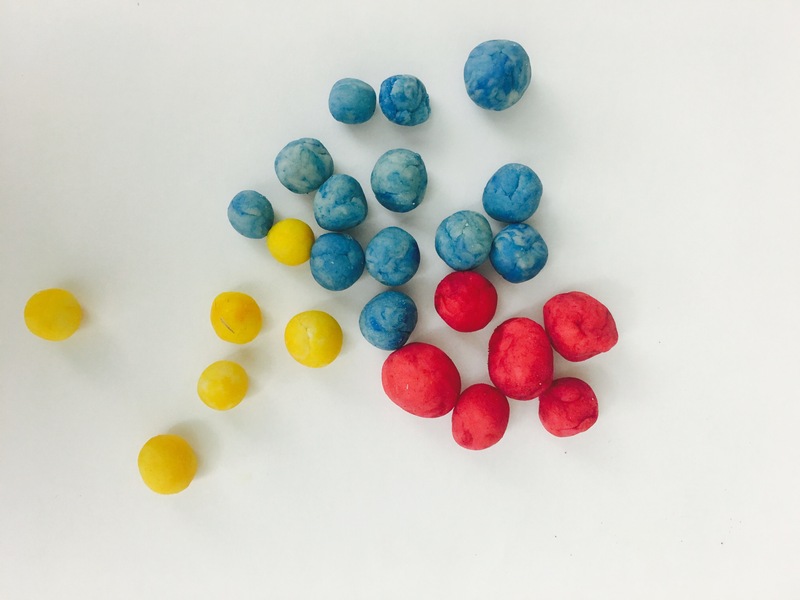 Students were asked to grab one red and one blue ball and mix them together, followed by one red and one yellow and finally one blue and one yellow. Once we created all the colors students were free to continue experimenting, sculpt or stack. 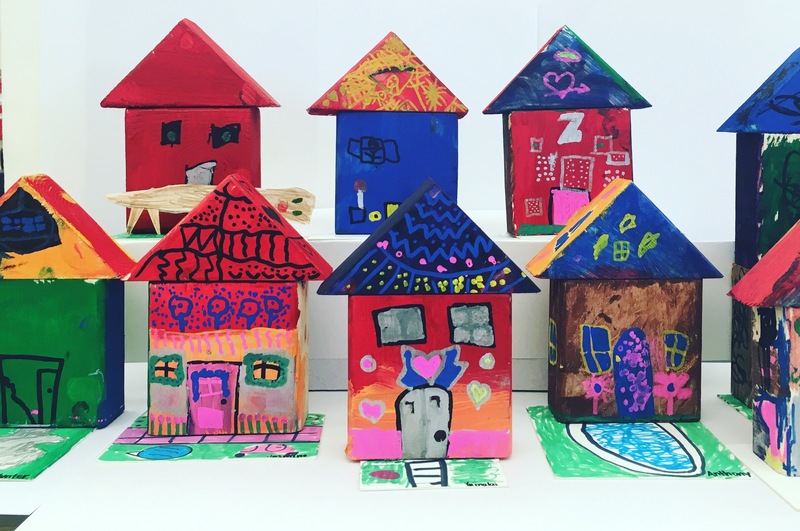 Today 2nd graders got a chance to create their own houses…well, miniature wooden houses is a more accurate description! I love this project because we have an opportunity to discuss so many things (design, form, sculpture, texture) and students can directly apply the knowledge. These houses were first created on paper, then students sanded their houses and a few even had a chance to apply a coat of paint. Cannot wait to see their designs come to life. Click below to see the tour of an entire neighborhood! A very good friend of mine had my family over for an afternoon, she served the kid’s snacks (four of them, all 3 and under) in a muffin tin. They LOVED it and we loved that they did not spill it or even complain. The muffin tin gave them choices and they were free to choose what they wanted. 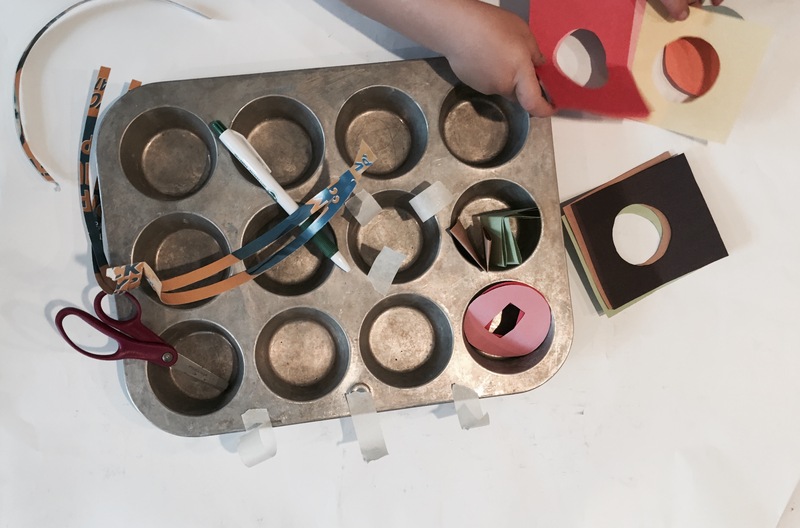 If these four kids loved eating snacks out of a muffin tin, I could only imagine how much they would love it as a CREATION area. There’s something about those circular, organized compartments that is so inviting, thus the idea of the CREATION STATION was born. Many of my friends and parents of my students tell me they have no idea where to start with creating art with their children at home. Whether you consider yourself a creative type or have the “I can’t draw a straight line with ruler” mentality, creating art with your children should be a fun, stress-free venture (and no, you don’t have to be good at art…or even like it). 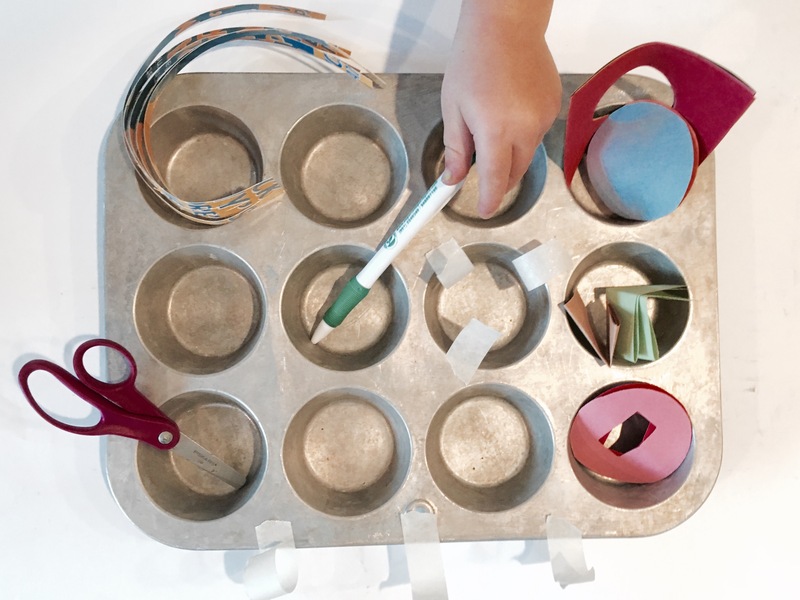 A Creation Station is simply be a variety of materials that children, without guidance, can use. The items should also be so tempting that they cannot help but want to explore the materials. Each tray consists of a variety of materials, many of which have no relation to each other. Your junk drawer and recycling bin are great places to start! It’s important to let your children explore the materials, freely. In other words, refrain from saying, “That’s not how we use a …..” One of the most valuable lessons children can learn from using a Creation Station is “thinking outside the box” by independently discovering creative uses and solutions (they are starting to think like inventors, innovators, scientists…and artists, of course). To reduce your stress, have the mindset that everything on the tray is disposable. Keep some of the spaces empty so children can reorganize or move objects around. 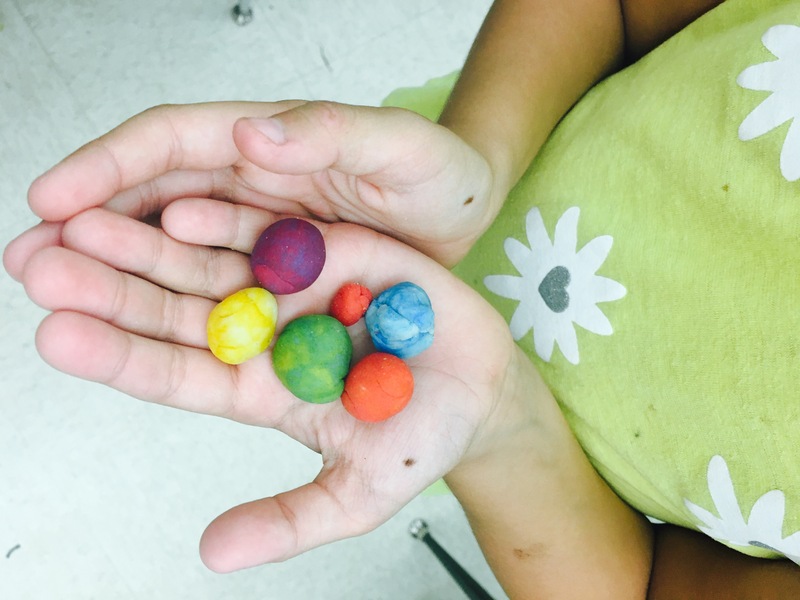 Plastic child scissors, 5 plastic beads, toothpicks, three crayons and homemade playdough (Playdough Recipe) rolled into three balls. Using crayons to poke holes in playdough. You can see the problem solving taking place! 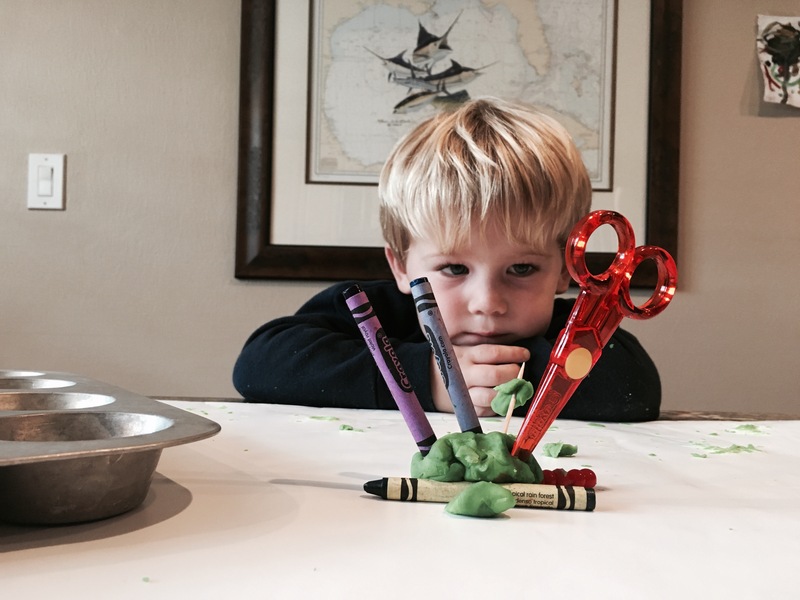 And just when I start to think he may be a creative genius, I am reminded he is still three…. and needs a snack break (eww). Chose an area free of distraction. We use our kitchen island because my younger son cannot reach it and my older son is free to think independently. It is important to set ground rules, for example, I require he remain seated and all materials have to stay on the table. When the Creation Station is set up, he may stay for 10 minutes or longer (40 minutes is our record). I don’t pressure him or give him suggestions, I just watch him explore. It is always amazing me the things he creates, often times, it is something I never even thought of doing. We are all learning from each other…that’s what it is all about. Check back weekly for Creation Station ideas & inspiration! One of the important things about elementary art is that it can create visual connections to so many other subject areas! Today we learned all about symbols by learning about our Sunshine State and all its symbols….the Northern Mocking Bird and the Orange Blossom Tree. We used Sharpies to create these (adorable) line drawing.